Galileo was punished by the Church for teaching that the sun is stationary and the earth moves around it. His opponents held the view that the earth is stationary and the sun moves around it. If the absolute motion has no meaning, are the two viewpoints not equally correct or equally wrong? The absolute motion has no meaning. In the relative motion view, the two viewpoints are the same. Hence, both viewpoints are equally correct or equally wrong. When a particle moves with constant velocity, its average velocity, its instantaneous velocity and its speed are all equal. Comment on this statement. Constant velocity means that a particle has the same direction and speed at every point. So, its average velocity and instantaneous velocity are equal. Its speed being a scalar quantity is equal in magnitude only. A car travels at a speed of 60 km/hr due north and the other at a speed of 60 km/hr due east. Are the velocities equal? If no, which one is greater? If you find any of the questions irrelevant, explain. No, as the directions of the cars are different, their velocities are not equal, as velocity is a vector quantity. We cannot compare velocities on the basis of direction only, so the question is irrelevant. A ball is thrown vertically upward with a speed of 20 m/s. Draw a graph showing the velocity of the ball as a function of time as it goes up and then comes back. The velocity of a particle is towards west at an instant. Its acceleration is not towards west, not towards east, not towards north and towards south. Give an example of this type of motion. Motion of a projectile at the highest point of its path: Because at this point, the projectile has only horizontal component of velocity. So, it can have velocity towards west and acceleration in the vertically downward direction. At which point on its path a projectile has the smallest speed? A projectile has the lowest speed at the highest point of its path because the vertical component of velocity is zero at this point. Two particles A and B start from rest and move for equal time on a straight line. The particle A has an acceleration a for the first half of the total time and 2a for the second half. The particle B has an acceleration 2a for the first and a for the second half. Which particle has covered larger distance? If a particle is accelerating, it is either speeding up or speeding down. Do you agree with this statement? Acceleration does not mean speeding up or speeding down. It means the change of velocity either in direction or in magnitude. A food packet is dropped from a plane going at an altitude of 100 m. What is the path of the packet as seen from the plane? What is the path as seen from the ground? If someone asks “what is the actual path”, what will you answer? The path of the packet (as seen from the plane) is a vertically downward straight line, as the horizontal velocity of the packet and the plane is the same. As seen from the ground, the path of the packet is a parabola. The path is defined with respect to some reference frame. As there is no absolute reference frame, no actual path is defined. Give examples where (a) the velocity of a particle is zero but its acceleration is not zero, (b) the velocity is opposite in direction to the acceleration, (c) the velocity is perpendicular to the acceleration. 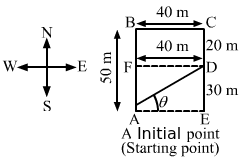 (a) At the highest point when a particle is thrown vertically upwards. (b) While going up when a particle is thrown vertically upwards. (c) At the highest point of a full projectile. In figure shows the x coordinate of a particle as a function of time. Find the sings of vx and ax at t = t1, t = t2 and t = t3. Slope of the x–t graph gives the velocity and change in the slope gives the acceleration. A player hits a baseball at some angle. The ball goes high up in space. The player runs and catches the ball before it hits the ground. Which of the two (the player or the ball) has greater displacement? The displacement of the ball and the player is the same, as the initial and final points are the same. The increase in the speed of a car is proportional to the additional petrol put into the engine. Is it possible to accelerate a car without putting more petrol or less petrol into the engine? Yes, it is possible to accelerate a car without putting more petrol or less petrol in the engine. This can be done by driving the car on a circular or curved track at a uniform speed. Rain is falling vertically. A man running on the road keeps his umbrella tilted but a man standing on the street keeps his umbrella vertical to protect himself from the rain. But both of them keep their umbrella vertical to avoid the vertical sun-rays. Explain. The speed of rain is less, so as we run, the direction of the relative velocity of the rain changes. But as the speed of light is very high, there is a measurable change in the relative velocity of light w.r.t. a person due to the relative motion between the sunrays and the person. ∆V=502+502+2×50×50cos90°=70km/hIt is towards southwest, as shown in the figure. In figure shows the displacement-time graph of a particle moving on the X-axis. (d) the particle moves at a constant velocity up to a time t0, and then stops. (d) The particle moves at a constant velocity up to a time t0 and then stops. 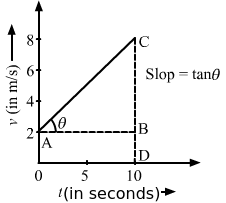 The slope of the x–t graph gives the velocity. In the graph, the slope is constant from t = 0 to t = t0, so the velocity is constant. After t = t0, the displacement is zero; i.e., the particle stops. (d) the information is insufficient to decide the relation of xA with xB. As velocity and acceleration are in opposite directions, velocity will become zero after some time (t) and the particle will return. ∴0=u-at ⇒t=uaBecause the value of acceleration is not given, we cannot say that the particle will return after/before 10 seconds. v=v1+v22Velocity is uniform in both cases; that is, acceleration is zero. 2v=1v1+1v2Velocity is uniform in both cases; that is, acceleration is zero. Gravity is the only force acting on the stone when it is released. And, we know that gravity is always in the downward direction. (d) the relation between vA and vB depends on height of the building above the ground. 12mv2+mghBoth the particles were at the same height and thrown with equal initial velocities, so their initial total energies are equal. By the law of conservation of energy, their final energies are equal. At the ground, they are at the same height. So, their P.E. are also equal; this implies that their K.E. should also be equal. In other words, their final velocities are equal. (d) is perpendicular to the acceleration for two instants. In projectile motion, velocity is perpendicular to acceleration only at the highest point. Here, velocity is along the horizontal direction and acceleration is along the vertically downward direction. Two bullets are fired simultaneously, horizontally and with different speeds from the same place. Which bullet will hit he ground first? (d) depends on the masses. (c) Both will reach simultaneously. Because the downward acceleration and the initial velocity in downward direction of the two bullets are the same, they will take the same time to hit the ground and for a half projectile. (d) the information is insufficient to decide the relation of RA with RB. R=u2sin2αgInformation of the initial velocity is not given in the question. A river is flowing from west to east at a speed of 5 metres per minute. A man on the south bank of the river, capable of swimming at 10 metres per minute in still water, wants to swim across the river in the shortest time. He should swim in a direction. (d) 60° east of north. If the man swims at any angle east to the north direction, although his relative speed will increase, he will have to travel a larger distance. So, he will take more time. If the man swims at any angle west to the north direction, his relative speed will decrease. So, he will take more time. Along the string, the velocity of each object is the same. Displacement is zero because the initial and final positions are the same. x = u (t − 2 s) + a (t − 2 s)2. (d) at t = 2 s particle is at the origin. (a) Average speed of a particle in a given time is never less than the magnitude of the average velocity. dv→dt≠0 but ddt=v→=0(c) The average velocity of a particle is zero in a time interval. It is possible that the instantaneous velocity is never zero is the interval. (d) The average velocity of a particle moving on a straight line is zero in a time interval. It is possible that the instantaneous velocity is never zero in the interval. (Infinite accelerations are not allowed). (c) The average velocity of a particle is zero in a time interval. It is possible that the instantaneous velocity is never zero in the interval, for example, the motion of a particle on a circular track with a constant speed. In uniform circular motion, speed is constant but velocity is not. (d) In one complete circle of uniform motion, average velocity is zero. Instantaneous velocity is never zero in the interval. (d) nonzero acceleration without having varying speed. Velocity and acceleration are vector quantities that can be changed by changing direction only (keeping magnitude constant). 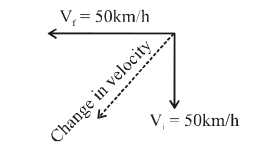 (a) If the velocity and acceleration have opposite sign, the object is slowing down. (b) If the position and velocity have opposite sign the particle is moving towards the origin. (c) If the velocity is zero at an instant, the acceleration should also be zero at that instant. (d) If the velocity is zero for a time interval, the acceleration is zero at any instant within the time interval. (a) If the velocity and acceleration have opposite signs, the object slows down. 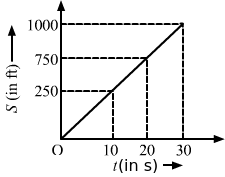 (b) If the position and velocity have opposite signs, the particle moves towards the origin. (c) If the velocity is zero in a certain time interval, then the change in the velocity in that time interval will also be zero. As acceleration is rate of change of velocity, it will also be zero at an instant in that time interval. The velocity of a particle is zero at t = 0. (a) The acceleration at t = 0 must be zero. (b) The acceleration at t = 0 may be zero. (c) If the acceleration is zero from t = 0 to t = 10 s, the speed is also zero in this interval. (d) If the speed is zero from t = 0 to t = 10 s the acceleration is also zero in this interval. (c) If the acceleration is zero from t = 0 s to t = 10 s, the speed is also zero in this interval. (d) If the speed is zero from t = 0 s to t = 10 s, the acceleration is also zero in this interval. (b) Acceleration will be zero only when the change in velocity is zero. (c) Since the acceleration is zero from t = 0 s to t = 10 s, change in velocity is 0. (d) From t = 0 s to t = 10 s, speed is zero. Here, velocity is zero and initial velocity is zero. So, the change in velocity is zero; i.e., acceleration is zero. (a) The magnitude of the velocity of a particle is equal to its speed. (b) The magnitude of average velocity in an interval is equal to its average speed in that interval. (c) It is possible to have a situation in which the speed of a particle is always zero but the average speed is not zero. (d) It is possible to have a situation in which the speed of the particle is never zero but the average speed in an interval is zero. (a) Velocity being a vector quantity has magnitude as well as direction, and magnitude of velocity is called speed. The magnitude of average velocity in an interval is not always equal to its average speed in that interval. (c) If speed is always zero, then the distance travelled is always zero. Hence, the total distance travelled and the average speed will be zero. (d) If the speed of a particle is never zero, the distance travelled by the particle is never zero. Hence, the average speed will not be zero. The velocity-time plot for a particle moving on a straight line is shown in the figure. (a) The particle has a constant acceleration. (b) The particle has never turned around. (c) The particle has zero displacement. (d) The average speed in the interval 0 to 10 s is the same as the average speed in the interval 10 s to 20 s.
(d) The average speed in the interval 0 s to 10 s is the same as the average speed in the interval 10 s to 20 s.
(a) The slope of the v–t graph gives the acceleration. For the given graph, the slope is constant. So, acceleration is constant. (b) From 0 to 10 seconds, velocity is in positive direction and then in negative direction. This means that the particle turns around at t = 10 s.
(c) Area in the v–t curve gives the distance travelled by the particle. (d) The area of the v–t graph from t = 0 s to t = 10 s is the same as that from t = 10 s to t = 20 s. So, the distance covered is the same. Hence, the average speed is the same. In figure shows the position of a particle moving on the X-axis as a function of time. (a) The particle has come to rest 6 times. (b) The maximum speed is at t = 6s. (c) The velocity remains positive for t = 0 to t = 6s. (d) The average velocity for the total period shown is negative. (a) The slope of the x–t graph gives the velocity. Here, 6 times the slope is zero. So, the particle has come to rest 6 times. (b) As the slope is not maximum at t = 6 s, the maximum speed is not at t = 6 s.
(c) As the slope is not positive from t = 0 s to t = 6s, the velocity does not remain positive. Total displacementTotal time taken=xfinal -xinitialtFor the shown time (t = 6 s), the displacement of the particle is positive. Therefore, the average velocity is positive. The accelerations of a particle as seen from two frames S1 and S2 have equal magnitude 4 m/s2. (a) The frames must be at rest with respect to each other. (b) The frames may be moving with respect to each other. (c) The acceleration of S2 with respect to S1 may either be zero of 8 m/s2. (d) The acceleration of S2 with respect to S1 may be anything between zero and 8 m/s2. A man has to go 50 m due north, 40 m due east and 20 m due south to reach a field. (a) What distance he has to walk to reach the field? (b) What is his displacement from his house to the field? A particle starts from the origin, goes along the X-axis to the point (20 m, 0) and then return along the same line to the point (−20 m, 0). Find the distance and displacement of the particle during the trip. Let the points be O(0,0), A(20 m, 0) and B(−20 m, 0). It is 260 km from Patna to Ranchi by air and 320 km by road. An aeroplane takes 30 minutes to go from Patna to Ranchi whereas a delux bus takes 8 hours. (a) Find the average speed of the plane. (b) Find the average speed of the bus. (c) Find the average velocity of the plane. (d) Find the average velocity of the bus. =3208=40 km/h(c) The plane moves in a straight path. When a person leaves his home for sightseeing by his car, the meter reads 12352 km. When he returns home after two hours the reading is 12416 km. (a) What is the average speed of the care during this period? (b) What is the average of velocity? ∴Average speed=642=32 km/h(b) Because he returns to his house, the displacement is zero. So, the average velocity is zero. An athlete takes 2.0 s to reach his maximum speed of 18.0 km/h. What is the magnitude of this average acceleration. The speed of a car as a function of time is shown in figure (3-E1). Find the distance travelled by the car in 8 seconds and its acceleration. Slope of the v–t graph gives the acceleration. tanθ=208=2.5 m/s2Area in the v–t graph gives the distance travelled. The acceleration of a cart started at t = 0, varies with time as shown in figure (3-E2). Find the distance travelled in 30 seconds and draw the position-time graph. ∴ From 10 to 20 seconds (âˆ†t = 20 − 10 = 10 s), the particle moves with a uniform velocity of 50 ft/s. Between 20 s to 30 s, acceleration is constant, i.e., −5 ft/s2. At 20 s, velocity is 50 ft/s. Figure (3-E3) Shows the graph of velocity versus time for a particle going along the X-axis. Find (a) the acceleration, (b) the distance travelled in 0 to 10 s and (c) the displacement in 0 to 10 s.
(a) Slope of the v–t graph gives the acceleration. =8-210=610=0.6 m/s2(b) Area in the v–t graph gives the distance travelled. 12×6×10+10×2=50 m(c) Displacement is the same as the distance travelled. Figure (3-E4) shows the graph of the x-coordinate of a particle going along the X-axis as a function of time. Find (a) the average velocity during 0 to 10 s, (b) instantaneous velocity at 2, 5, 9 and 12s. vavg=xt=10010=10 m/s(b) Slope of the x–t graph gives the velocity. At 5 s, vinst = 0. At 8 s, vinst = 20 m/s. At 12 s, vinst = −20 m/s. From the velocity-time plot shown in figure (3−E5), find the distance travelled by the particle during the first 40 seconds. Also find the average velocity during this period. Area shown in the v–t graph gives the distance travelled. As the displacement is zero, the average velocity is zero. Figure (3−E6) shows x–t graph of a particle. Find the time t such that the average velocity of the particle during the period 0 to t is zero. Consider point B1 at 12 s.
At t = 0 s, S = 20 m and at t = 12 s, S = 20 m.
For the time interval 0–12, change in the displacement is zero. Average velocity=DisplacementTime=0Hence, the time is 12 seconds. FigureA particle starts from a point A and travels along the solid curve shown in figure (3−E7). Find approximately the position B of the particle such that the average velocity between the position A and B has the same direction as the instantaneous velocity at B.
BC→are in the same direction. The point is B (5 m, 3 m). An object having a velocity 4.0 m/s is accelerated at the rate of 1.2 m/s2 for 5.0 s. Find the distance travelled during the period of acceleration. A person travelling at 43.2 km/h applies the brake giving a deceleration of 6.0 m/s2 to his scooter. How far will it travel before stopping? A train starts from rest and moves with a constant acceleration of 2.0 m/s2 for half a minute. The brakes are then applied and the train comes to rest in one minute. Find (a) the total distance moved by the train, (b) the maximum speed attained by the train and (c) the position(s) of the train at half the maximum speed. Let the final velocity be v before the brakes are applied. A bullet travelling with a velocity of 16 m/s penetrates a tree trunk and comes to rest in 0.4 m. Find the time taken during the retardation. A bullet going with speed 350 m/s enters a concrete wall and penetrates a distance of 5.0 cm before coming to rest. Find the deceleration. A particle starting from rest moves with constant acceleration. If it takes 5.0 s to reach the speed 18.0 km/h find (a) the average velocity during this period, and (b) the distance travelled by the particle during this period. A driver takes 0.20 s to apply the brakes after he sees a need for it. This is called the reaction time of the driver. If he is driving a car at a speed of 54 km/h and the brakes cause a deceleration of 6.0 m/s2, find the distance travelled by the car after he sees the need to put the brakes on. In the reaction time, the car moves with a constant speed of 54 km/h, i.e., 15 m/s. Braking distance: Distance travelled after the brakes are applied. A police jeep is chasing a culprit going on a motorbike. The motorbike crosses a turning at a speed of 72 km/h. The jeep follows it at a speed of 90 km/h, crossing the turning ten seconds later than the bike. Assuming that they travel at constant speeds, how far from the turning will the jeep catch up with the bike? In 10 seconds, the culprit reaches point B from point A. At time t = 10 s, the police jeep is 200 m behind the culprit. Time=Distance to be coveredRelative velocity=2005= 40 sIn 40 seconds, the police jeep moves from point A to a distance s‘ to catch the culprit. Thus, the jeep will catch up with the bike 1.0 km away from the turning. A car travelling at 60 km/h overtakes another car travelling at 42 km/h. Assuming each car to be 5.0 m long, find the time taken during the overtake and the total road distance used for the overtake. A ball is projected vertically upward with a speed of 50 m/s. Find (a) the maximum height, (b) the time to reach the maximum height, (c) the speed at half the maximum height. Take g = 10 m/s2. At the highest point, velocity v of the ball is 0. A ball is dropped from a balloon going up at a speed of 7 m/s. If the balloon was at a height 60 m at the time of dropping the ball, how long will the ball take in reaching the ground? Balloon is moving upwards with velocity 7 m/s. The balloon and the ball are moving upwards with the same speed. When the ball is dropped, its initial velocity (u) is −7 m/s. 60=-7t+12×9.8×t2⇒60=-7t+4.9×t2⇒4.9t2-7t-60=0t=7±49-4×4.9 ×-602×4.9t=7±49+11769.8t=7±359.8We will ignore the −ve sign in the above equation because time can never be negative. A stone is thrown vertically upward with a speed of 28 m/s. (a) Find the maximum height reached by the stone. (b) Find its velocity one second before it reaches the maximum height. 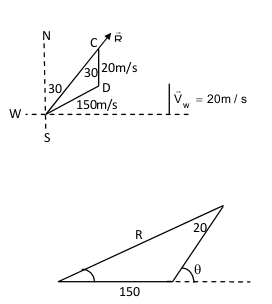 (c) Does the answer of part (b) change if the initial speed is more than 28 m/s such as 40 m/s or 80 m/s? When the stone reaches the ground, its final velocity (v) is 0. (a) Maximum height can be found using the equation of motion. ⇒t=0-28-9.8=2.85 sAs per the question, we need to find the velocity of the stone one second before it reaches the maximum height. (c) No answer of part (b) will not change, as after one second, the velocity becomes zero for any initial velocity and acceleration (a = − 9.8 m/s2) remains the same. For any initial velocity more than 28 m/s, only the maximum height increases. A person sitting on the top of a tall building is dropping balls at regular intervals of one second. Find the positions of the 3rd, 4th and 5th ball when the 6th ball is being dropped. A person is releasing balls from a tall building at regular intervals of one second. It means for each ball, the initial velocity u is 0. When the 6th ball is dropped, the 5th ball moves for 1 second, the 4th ball moves for 2 seconds and the 3rd ball moves for 3 seconds. A healthy youngman standing at a distance of 7 m from a 11.8 m high building sees a kid slipping from the top floor. With what speed (assumed uniform) should he run to catch the kid at the arms height (1.8 m)? The kid should be caught over 1.8 m from ground. As the kid is slipping, his initial velocity u is 0. ⇒10=0+12×9.8×t2⇒t2=104.9=2.04⇒t=1.42 sThis is the time in which the man should reach the bottom of the building to catch the kid. An NCC parade is going at a uniform speed of 6 km/h through a place under a berry tree on which a bird is sitting at a height of 12.1 m. At a particular instant the bird drops a berry. Which cadet (give the distance from the tree at the instant) will receive the berry on his uniform? Using the equation of motion, we can find the time taken t by the berry to reach the ground. Therefore, the cadet who is 2.6 m away from tree will receive the berry on his uniform. A ball is dropped from a height. If it takes 0.200 s to cross the last 6.00 m before hitting the ground, find the height from which it was dropped. Take g = 10 m/s2. s=ut+12at26=u0.2+12×10×0.04⇒u=5.80.2=29 m/sLet h be the height from which the ball is dropped. A ball is dropped from a height of 5 m onto a sandy floor and penetrates the sand up to 10 cm before coming to rest. Find the retardation of the ball is sand assuming it to be uniform. A ball is dropped from a height of 5 m (s) above the sand level. The same ball penetrates the sand up to 10 cm (ss) before coming to rest. ⇒5=0+129.8t2⇒t2=54.9=1.02⇒t=1.01 sThus, the time taken by the ball to cover the distance of 5 m is 1.01 seconds. Hence, for the motion of the ball in the sand, the initial velocity u2 should be 9.89 m/s and the final velocity v2 should be 0.
as=v22-u222ss=0-9.8922×0.1⇒as≈-490 m/s2Hence, the sand offers the retardation of 490 m/s2. An elevator is descending with uniform acceleration. To measure the acceleration, a person in the elevator drops a coin at the moment the elevator starts. The coin is 6 ft above the floor of the elevator at the time it is dropped. The person observes that the coin strikes the floor in 1 second. Calculate from these data the acceleration of the elevator. Let a be the acceleration of the elevator. It is given that the coin reaches the floor in 1 second. This means that the coin travels 6 ft distance. The initial velocity is u for the coin and zero for the elevator. 6=12×32-a12=32-a∴a=20 fts-2Hence, the acceleration of the elevator is 20 ft/s2. A ball is thrown horizontally from a point 100 m above the ground with a speed of 20 m/s. Find (a) the time it takes to reach the ground, (b) the horizontal distance it travels before reaching the ground, (c) the velocity (direction and magnitude) with which it strikes the ground. (a) Let t be the time taken by the ball to reach the ground. ∴t=2hg⇒t=2×1009.8=4.5 sTherefore, the time required by the ball to reach the ground is 4.5 seconds. (c) We know that horizontal velocity remains constant throughout the motion of the ball. At A, vx = 20 m/s. vr=44.12+202≈49 m/stan β=vyvx=44.120=2.205⇒β=tan-1 2.205=66°Therefore, the ball strikes the ground with a magnitude of velocity 49 m/s and the direction at an angle of 66° with the ground. A ball is thrown at a speed of 40 m/s at an angle of 60° with the horizontal. Find (a) the maximum height reached and (b) the range of the ball. Take g = 10 m/s2. In a soccer practice session the football is kept at the centre of the filed 40 yards from the 10 ft high goalposts. A goal is attempted by kicking the football at a speed of 64 ft/s at an angle of 45° to the horizontal. Will the ball reach the goal post? The football is kept at a distance of 40 yards, i.e., 120 ft, from the goalpost. For the given question, 40 yards is the horizontal range (R). Yes, the football will reach the goalpost. A popular game in Indian villages is goli which is played with small glass balls called golis. The goli of one player is situated at a distance of 2.0 m from the goli of the second player. This second player has to project his goli by keeping the thumb of the left hand at the place of his goli, holding the goli between his two middle fingers and making the throw. If the projected goli hits the goli of the first player, the second player wins. If the height from which the goli is projected is 19.6 cm from the ground and the goli is to be projected horizontally, with what speed should it be projected so that it directly hits the stationery goli without falling on the ground earlier? We know that the goli moves in projectile motion. The time in which the goli will reach the ground is given by the equation of motion. t=2hg=2×0.1969.8 =0.4 = 0.2 sLet us assume that the goli is projected with horizontal velocity ux m/s. 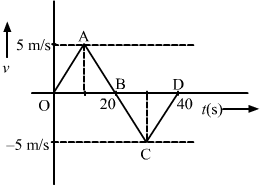 ⇒u=Rt=20.2=10 m/sHence, if the second player projects the goli with a speed of 10 m/s, then his goli will hit the goli of the first player. Figure (3−E8) shows a 11.7 ft wide ditch with the approach roads at an angle of 15° with the horizontal. With what minimum speed should a motorbike be moving on the road so that it safely crosses the ditch? Assume that the length of the bike is 5 ft, and it leaves the road when the front part runs out of the approach road. 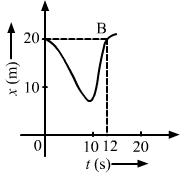 The approach road makes an angle of 15Ëš (α) with the horizontal. u2=Rgsin2α=16.7 ×32.2sin30°⇒u≈32 ft/sTherefore, the minimum speed with which the motorbike should be moving is 32 ft/s. A person standing on the top of a cliff 171 ft high has to throw a packet to his friend standing on the ground 228 ft horizontally away. If he throws the packet directly aiming at the friend with a speed of 15.0 ft/s, how short will the packet fall? As per the question, the person throws the packet directly aiming to his friend at the initial speed (u) of 15.0 ft/s. When the person throws the packet from the top of the cliff, it moves in projectile motion. Let us take the reference axis at point A.
u is below the x-axis. A ball is projected from a point on the floor with a speed of 15 m/s at an angle of 60° with the horizontal. Will it hit a vertical wall 5 m away from the point of projection and perpendicular to the plane of projection without hitting the floor? Will the answer differ if the wall is 22 m away? ⇒R=152×sin2×60°9.8=19.88 mAs the horizontal range of the projectile is 19.88 m, the ball will hit the wall 5 m away from the point of projection. If the wall is 22 m away from the point of projection, the ball will hit the wall because it is not in its horizontal range. Find the average velocity of a projectile between the instants it crosses half the maximum height. 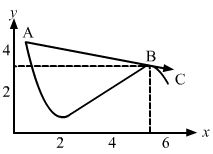 It is projected with a speed u at an angle θ with the horizontal. =Change in displacementTimeConsider the projectile motion in the figure given below. 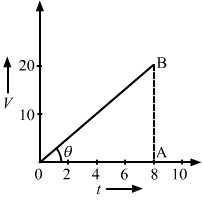 By the symmetry of figure, it can be said that the line joining points A and B is horizontal. So, there will be no effect of the vertical component of velocity of the projectile during displacement AB. We know that the projectile moves at a constant velocity ucosθ in horizontal direction. Hence, the average velocity of the projectile is ucosθ. A bomb is dropped from a plane flying horizontally with uniform speed. Show that the bomb will explode vertically below the plane. Is the statement true if the plane flies with uniform speed but not horizontally? The plane is flying horizontally with a uniform speed. Therefore, the bomb also has the same speed. Let the speed of the plane be represented by u. Now, let t be the time taken by the bomb to reach the ground. Both the plane and bomb are travelling in the same direction. Hence, the bomb will explode vertically below the plane. Let us consider it will make an angle of projection θ along the horizontal direction. So, both the plane and the bomb will be flying with the same angle of projection. Therefore, both will have the same horizontal speed ucosθ, where u is the initial speed of the plane and the bomb. When the bomb is released, the time taken by the bomb to reach the ground is t.
The distance travelled by the bomb and the plane will be ucosθt. Hence, again the bomb will explode vertically below the plane. (i) During the motion of bomb, its horizontal velocity u remains constant and is the same as that of the plane at every point of its path. Let the bomb reach the ground in time t.
Distance travelled in horizontal direction by the bomb is the same as that travelled by the plane. So, the bomb will explode vertically below the plane. (ii) Let the plane move making an angle α with the horizontal. So, in this case also, the bomb will explode vertically below the plane. A boy standing on a long railroad car throws a ball straight upwards. The car is moving on the horizontal road with an acceleration of 1 m/s2 and the projection velocity in the vertical direction is 9.8 m/s. How far behind the boy will the ball fall on the car? Let u be the initial velocity of the car when the ball is thrown. Both the car and the ball have the same horizontal velocity. Here, t is the time. s’-s=12at2=12×1×22=2 mTherefore, the ball drops 2 m behind the boy. A staircase contains three steps each 10 cm high and 20 cm wide (figure 3−E9). What should be the minimum horizontal velocity of a ball rolling of the uppermost plane so as to hit directly the lowest plane? To directly hit the lowest plane, the ball should just touch point E.
Let point A be the origin of reference coordinate. Let u be the minimum speed of the ball. ⇒-20=-8000002u2⇒u=200 cm/s=2 m/sThus, the minimum horizontal velocity of the ball is 2 m/s. A person is standing on a truck moving with a constant velocity of 14.7 m/s on a horizontal road. The man throws a ball in such a way that it returns to the truck after the truck has moved 58.8 m. Find the speed and the angle of projection (a) as seen from the truck, (b) as seen from the road. (a) Therefore, we can say that the time taken by the truck to cover 58.8 m distance is equal to the time of the flight of the truck. Time (T)=sv=58.814.7=4 sWe consider the motion of the ball going upwards. 19.6 m/s is the initial velocity with which the ball is thrown upwards. (b) From the road, the motion of ball seems to be a projectile motion. Here, α is the angle of projection. Now, take the vertical component of velocity. v2-u2=2ayHere, v is the final velocity. ⇒u=14.7cos53°=24.42 m/s≈25 m/sTherefore, when seen from the road, the speed of the ball is 25 m/s and the angle of projection is 53° with horizontal. The benches of a gallery in a cricket stadium are 1 m wide and 1 m high. A batsman strikes the ball at a level one metre above the ground and hits a mammoth sixer. The ball starts at 35 m/s at an angle of 53° with the horizontal. The benches are perpendicular to the plane of motion and the first bench is 110 m from the batsman. On which bench will the ball hit? The batsman strikes the ball 1 m above the ground. Let the ball land on the nth bench. The ball will hit the sixth bench of the gallery. A man is sitting on the shore of a river. He is in the line of 1.0 m long boat and is 5.5 m away from the centre of the boat. He wishes to throw an apple into the boat. If he can throw the apple only with a speed of 10 m/s, find the minimum and maximum angles of projection for successful shot. Assume that the point of projection and the edge of the boat are in the same horizontal level. R=u2sin2αg ⇒6=102sin 2α10⇒sin 2α=35⇒α=18° or 71°For a successful shot, the angle of projection α with initial speed 10 m/s may vary from 15° to 18° or from 71° to 75°. The minimum angle is 15° and the maximum angle is 75°, but there is an interval of 53° for which the successful shot is not allowed. We can show this by putting the successive value of α from 15° to 75°. A river 400 m wide is flowing at a rate of 2.0 m/s. A boat is sailing at a velocity of 10 m/s with respect to the water, in a direction perpendicular to the river. (a) Find the time taken by the boat to reach the opposite bank. (b) How far from the point directly opposite to the starting point does the boat reach the opposite bank? Boat is sailing at the rate of 10 m/s. The vertical component of velocity 10 m/s takes the boat to the opposite shore. The boat sails at the resultant velocity vr. tan θ=210=15The boat will reach point C.
vr=102+22=10.2 m/sLet α be the angle made by the boat sailing with respect to the direction of flow. A swimmer wishes to cross a 500 m wide river flowing at 5 km/h. His speed with respect to water is 3 km/h. (a) If he heads in a direction making an angle θ with the flow, find the time he takes to cross the river. (b) Find the shortest possible time to cross the river. As per the question, the swimmer heads in a direction making an angle θ with the flow. We know that the vertical component of velocity 3sinθ takes him to the opposite side of the river. Time=0.53sinθ h=500×65sinθ=600sin90° s =600 sHence, the required time is 10 minutes. Consider the situation of the previous problem. The man has to reach the other shore at the point directly opposite to his starting point. If he reaches the other shore somewhere else, he has to walk down to this point. Find the minimum distance that he has to walk. As per the question, the man has to reach the other shore at the point directly opposite to his starting point. Horizontal distance is BD for the resultant velocity vr. Time=DistanceVelocity=0.53sinθ hThis is the same as the horizontal component of velocity. An aeroplane has to go from a point A to another point B, 500 km away due 30° east of north. A wind is blowing due north at a speed of 20 m/s. The air-speed of the plane is 150 m/s. (a) Find the direction in which the pilot should head the plane to reach the point B. (b) Find the time taken by the plane to go from A to B. B from A is 30Ëš east of north. R→be the resultant direction of the plane to reach point B. Two friends A and B are standing a distance x apart in an open field and wind is blowing from A to B. A beat a drum and B hears the sound t1 time after he sees the event. A and B interchange their positions and the experiment is repeated. This time B hears the drum timer after he sees the event. Calculate the velocity of sound in still air v and the velocity of wind u. Neglect the time light takes in travelling between the friends. Here, t1 is the time at which the sound of the drum is heard by B. Suppose A and B in the previous problem change their positions in such a way that the line joining them becomes perpendicular to the direction of wind while maintaining the separation x. What will be the time B finds between seeing and hearing the drum beating by A? Let v be the velocity of sound in the direction along line AC. Let u be the velocity of air in the direction along line AB. AD→=v2-u2Here, the time taken by light to reach B is neglected. Six particles situated at the corner of a regular hexagon of side a move at a constant speed v. Each particle maintains a direction towards the particle at the next corner. Calculate the time the particles will take to meet each other. A regular hexagon has a side a. Six particles situated at the corners of the hexagon are moving with a constant speed v.
As per the question, each particle maintains a direction towards the particle at the next corner. So, particles will meet at centroid O of triangle PQR. Now, at any instant, the particles will form an equilateral triangle PQR with the same centroid O. We know that P approaches Q, Q approaches R and so on. Now, we will consider the motion of particle P. Its velocity makes an angle of 60Ëš. This component is the rate of decrease of distance PO.